Jio Summer Surprise Offer Withdraw completely from Now. Jio Users will not able to get this Offer from 8th April 2017. The Last date has gone to become the Prime Member and eligible for Jio's new summer surprise offer. While many users didn't have done any recharges till. Some users also complained that the Jio's Server went down on 7th and 8th April. So, Jio also alerted to the users about withdrawn of this Offer on Jio.com and MyJio App. Jio Users also got many messages from the care regarding this offer and be hurry up to activate Rs 303 pack and enjoy unlimited complimentary access to Jio Services for 3 Months. Here are some questions that are running on every Jio Users Mind. We have seen those queries from some of the Internet Resources and Forums. 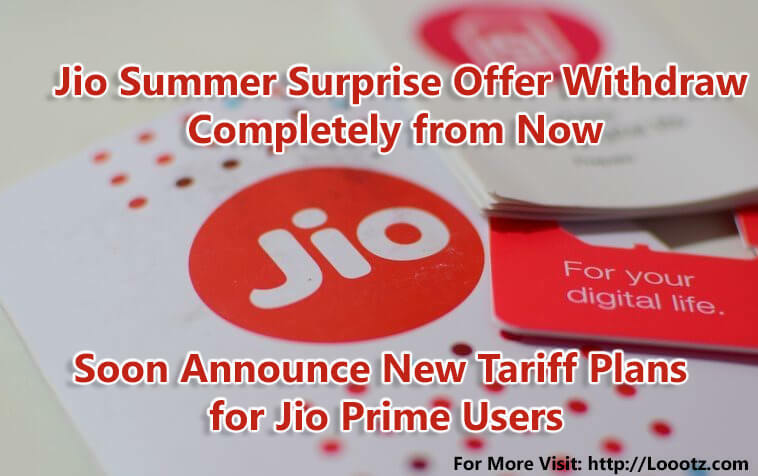 Will Jio Announce New offer for its users after Jio Summer Surprise offer Withdraw? As You Know, TRAI already advised to Jio to stop Summer Surprise Offer. Other Telecom Companies facing huge loss and getting so many troubles to alive on today's Telecom Market. The good news is that after this offer Jio will launch new tariff plans for its Jio Prime users and Non-Prime Users. How to Activate Jio Prime? If you are looking on the Internet and want to activate Jio Prime then You're at right place. You can visit jio.com or Open MyJio App to subscribe and activate Jio Prime Service before the last date 15th April 2017. If I'm not Prime Member then what will happen to my non-prime number? Of course, You will not get great offers as like Prime Members. It just costs you around Rs 99 to activate Jio Prime. As Well, Jio will give you Rs 50 Voucher. It will be useful to activate any plan from Jio's website. You can Check it out on MyJio App under category My Plans from Top Left Sidebar as well as on official website Jio.com. What are the New Tariff Plans for Jio Prime Members? Jio didn't announce any New Tariff Plans officially. But You can see the New Banner on Jio.com that shows you it's coming soon. How to check I'm a Prime member or Not? If you wanna check that you're Jio Prime Member or Not then open MyJio App and Tap on Sidebar in Top Left Corner. Under, you can see my plans category, Tap on it. Now, You will see two tabs, the first is Plan Details and the second one is Prime Membership Tab. Tap on Prime Membership Tab and see, are you the prime member or not. After, Jio Summer Surprise Offer Withdraw, Some Telco Companies easily breath to relief.